Use GetResponse forms and our Facebook Web Form App to collect sign-ups. 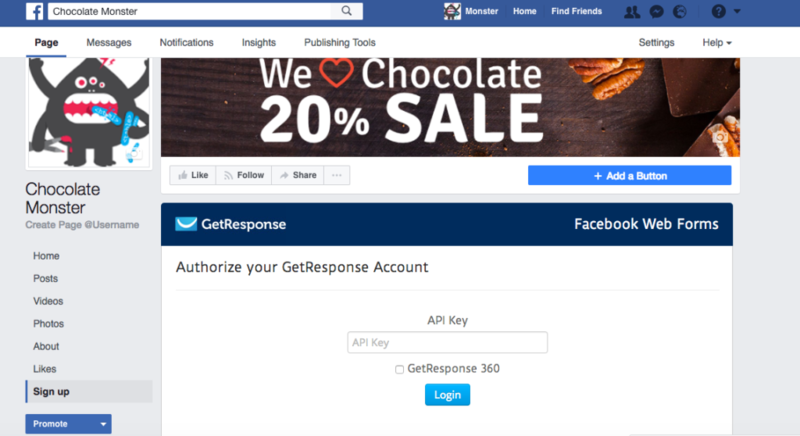 Simply add a sign-up form you created in the GetResponse account to your Facebook Page. This application is compatible with embedded, pop over, and scroll forms. 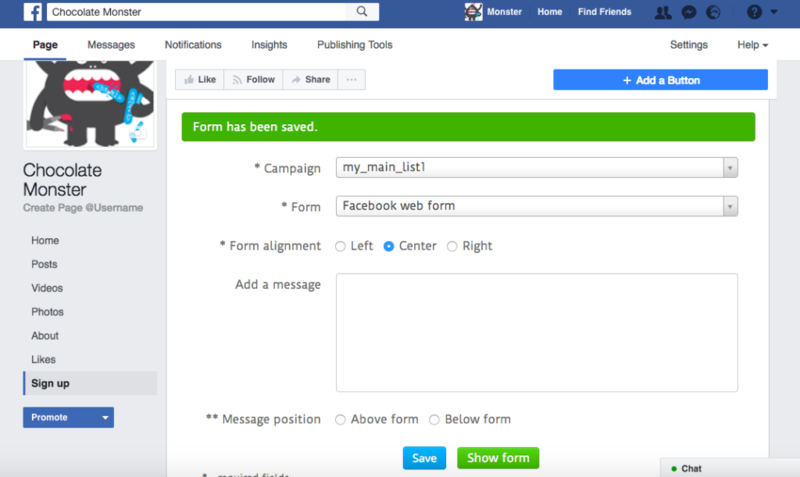 Create a form you’d like to add to the Facebook Page. Take this shortcut to get to the form creator. If you want to use a custom thank-you page, make sure that the page URL starts with https:// (not http) and the page supports iframe. Create a Page in your Facebook account. Note: If you’ve used our previous version of the Facebook Web Form App, you don’t need to install it again. It updates automatically. Click the Add to Fan Page button. 3. Click the Continue as button to authorize the app. 4. Expand the Facebook Pages menu to select the page you want to add the sign-up form to. Next, click Add Page Tab. Note: You must be the page admin to be able to do it. The page you choose must be a Facebook Page. 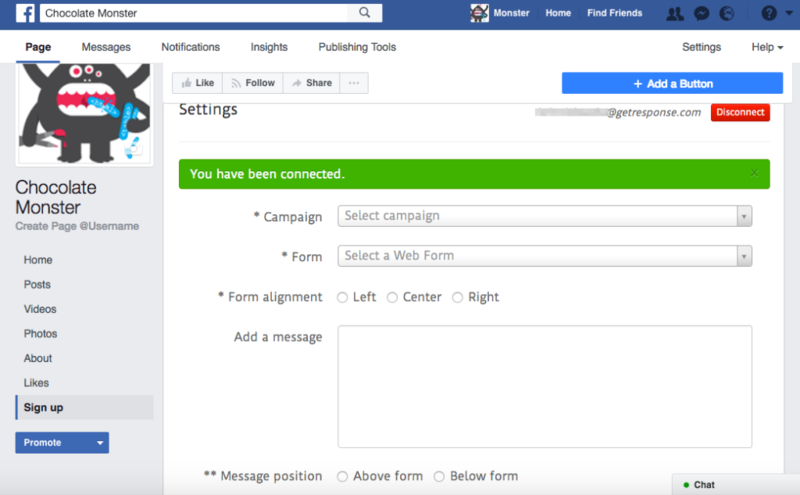 It’s not possible to place the form on your Facebook profile or Facebook Group. 5. Go to your Facebook Page. You’ll see a new Sign up tab in the page tabs section. Select the tab. 6. Enter the GetResponse API key. Go to My Account>>Integrations>>API & OAuth–or take this shortcut–to get the key. Next, click Login. A success message appears to confirm you’ve connected your GetResponse and Facebook accounts. Note: basic HTML tags are allowed: <div> <p> <span> <a> <br> <h1> <h2> <h3> <style> <b> <u> <i> Adding images is not allowed. Adjust the position of the additional text (required if you add a message). 8. Click Save to finish the setup and add the form to the Page. To preview the form, click Show form. How to edit the settings and share the tab? the application name displayed in the tab from Sign up to a custom name. Log into your fan page and go to Settings>>Edit page. Under Tabs, find Sign up and click Settings. 4. In the pop-up modal, select Change to add the thumbnail. The image dimensions must be 111 pixels high x 74 pixels wide and less than 1MB in size. You can also type in a new name for the tab. 5. Click Save and then OK.
Repeat Steps 1-3 you would take to edit the settings. Copy the URL you can find under Share Sign up tab. Why does the “Invalid API” message mean? If you’re using IE or Safari, you may encounter an “Invalid API” error message when connecting your GetResponse account to Facebook. Please switch to Mozilla or Chrome.